I have wanted to try a new skincare range for a while, I didn't know which brand to choose but I knew I wanted more natural products. I am not unhappy with the other products I was using but I wanted to try something different and products with more natural, skin friendly ingredients. I was very kindly sent a sample set to try from Green People, I expected sample sachets but it is a large set! To check out my disclaimer, click here. I have the *Green People Sensitive Skin Solutions Set (£29.95) which contains three products - the Scent Free Cleanser (50ml), Scent Free 24-Hour Cream (50ml) and the Scent Free Eye Cream (10ml). I think this set is a great way of trying all of the products in this range - it would make a great gift too. Firstly, the delivery was quick and the items were well packaged. The packaging of the actual products is great too, very simple. *Green People Sensitive Scent Free Cleanser & Makeup Remover (£18.95 for 200ml): The cleanser has a pump dispenser so you can easily control how much you use so there is no waste. The cleanser is very smooth and creamy on the skin and I feel like it cleanses my skin well, although it does not strip my skin! The cleanser does not irritate my skin at all (and I have eczema occasionally). Overall, this cleanser is just fantastic for dry, sensitive skin, I cannot recommend it enough. Also it is 91% organic. ★★★★★, 5/5! *Green People Sensitive Scent Free Anti-ageing 24 Hour Cream (£15.95 for 50ml): The skincare item that can irritate my skin the most is moisturiser, although I had no such problems with this product! The cream is fairly thick but it is smooth and applies nicely to the skin. It doesn't feel heavy or greasy on the skin and it absorbs quickly leaving my skin smooth, soothed and moisturised. No irritation at all! It does have a slight scent which may be from the packaging, I am not sure, but it isn't strong or unpleasant. It provides just the right amount of moisture and leaves my skin comfortable. I cannot comment on the anti-ageing benefits as I am only 21 but it is a lovely facial moisturiser! ★★★★★, 5/5! *Green People Rejuvenating Eye Cream (£9.50 for 10ml): I have a love hate relationship with eye creams, I feel like the ones I have tried do work but they are time consuming to use and the benefits are often only noticed after long term use. Although I feel it is important to use eye cream on a daily basis. The packaging for this eye cream looks like a lip balm tube, it is quite handy and would be great for travelling. The cream is light weight, it absorbs quickly and it leaves the skin feeling smooth and hydrated but not overly so. ★★★★☆, 4/5! Overall, I am very impressed with the brand and products - also 10% of the net profit goes to charity! Also I tried a sample of their *Help At Hand Cream which I really like, great scent and it didn't irritate my skin. 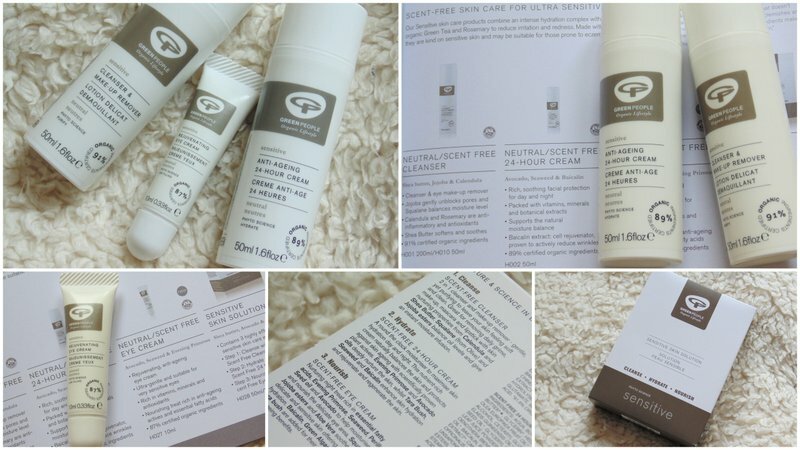 Green People are offering 10% off their sensitive skin range which lasts all month! Have you tried anything from Green People? Looks like a great set, I'll have to check out that discount!